Making powwow drums is a great challenge and a serious responsibility. We wish to honour and give thanks to our teachers who have guided us to bring these ceremonial drums to the people. The drum is sacred to our people, and when the voices of our ancestors are brought back to us through the drum we thank the singers who are healing our people and Mother Earth. Please note that the web site www.tribalspirit.ca is also us (just an earlier web site). We know powwow drum groups. We work hard to respond to their needs and requirements. We personally build each and every one of our drums with prayer and love. The vast majority of our drums can be found somewhere out on the Powwow Trail on Turtle Island working for the people. Over the past decade we have built many drums and we are extremely honoured to have many of the best groups playing our drums, not to mention some of the best groups coming up. Each year, we sponsor the Gathering of Nations Singing Contest, the Powwow Idol Contest as well as many other powwow drum and hand drum competitions. We believe that the drum is a tool for the community, to gather around, remember our history and build the future. Our job with each drum we build is to help facilitate this process of evolution. We have also started a record label: Tribal Spirit Fair Trade Music, We have recorded, Black Bear, Chippewa Travellers, Eastern Eagle, A Tribe Called Mi'kmaq, Smoke Trial, and a hand drum cd by Eastern Eagle.....available from us, directly from the groups or online at iTunes. We build our authentic powwow drums to travel, which means that we over-build their frames (translation: really strong). 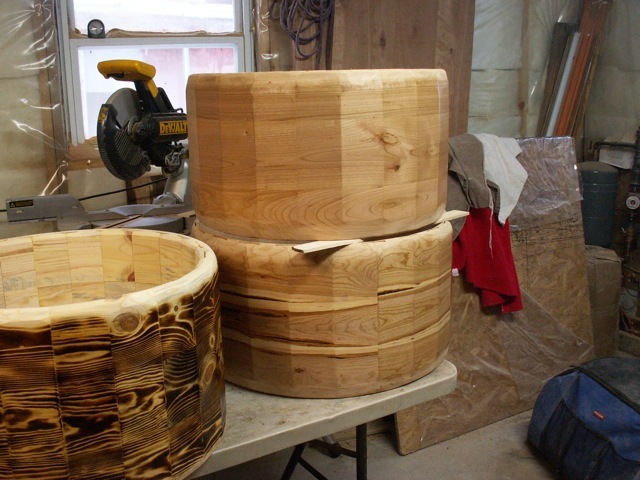 Our larger drums (24" to 36") have 1 1/4" thick solid cedar wood frames. We do not build plywood laminate drums!! This ensures that they can resist the wear and tear of travel, stand up to the huge tension the skin places on the frame and still give the deep, rich sound that only solid wood can provide. We choose to build our drums in this manner because, not only does it make them resilient to travel, we can guarantee them without concern of "comebacks". Our drum frames are guaranteed for life. We also build a smaller drum which we call our Family Drum. It is 22” x 14” also made or cedar. These little drums are very popular with families as it is perfect for pulling out during a celebration or gathering and it fits into a tight budget. We have also received many requests from youth groups who are just learning and gathering their songs, and are not yet ready for a big drum. Several well known groups have chosen to add the “Family Drum” to their collection because it is easily portable, yet still gives a very strong and powerful sound. If you are flying across the country for a powwow, this drum moves easily — we actually have one singer who travels to powwows from Ontario to Arizona with his 22" drum on his back. Our smallest powwow drum is an 18” x 12”. Made with butternut, it is totally designed for the age 2 to 5 crowd. For years, singers have asked us for a real kids drum so that their youngster could play on his ‘very own drum’. This drum is new this year and has already been very popular with the Sesame Street crowd. We often receive requests for 36" and even 40" drums. Generally I suggest getting out a tape measure, just to understand how huge a 36" drum is. They are very hard to travel with. They do not fit into any car, so a van or truck is required. But in response to the demand for really large drums, we are introducing a 36" and a 40" diameter drum to our line up.....but beware, these drums are huge! Of course, so is the sound!! Building good drums is all about managing tension and humidity changes. We glue together a 15” or 18” wide board and then cut it up into many pieces, all angled to be glued together. We use cedar, cherry and butternut woods, to play with different sounds. They all produce a wonderful resonating loud bass, but there are tone differences between the woods. Great singers pick this up and are inspired by it. Generally, we work with moose hides which we gather ourselves during hunting season. Moose is the best hide for resisting the challenges of humidity and cold weather. This year, the family (Robert, Joywind, her sister Rose and her son Joshua) gathered about 400 moose from local hunters who hunt for food (plus about 800 deer for leather and hand drums). Each spring, once the hides have been processed into raw hide, they are sorted. The thickest ones are chosen for our powwow drums. Because there are so many hides to choose from, we have the luxury of rejecting hides which are not going to hold up under very humid or cold situations. The thinner ones are put aside for hand drums. (The BEST round dance hand drum is a moose drum - they never go flat.) We do work with buffalo and steer as well, but are not fans of the current buffalo powwow drum. The issue with buffalo is that because they are farmed for their meat, they are killed at a young age (especially with buffalo, the older the animal the tougher the meat), which means that the skin tends to be thinner than a mature wild moose. Both moose and buffalo were used for sacred drums in the past. Clearly, the plains folks used buffalo, and buffalo has gotten most of the attention over the years. But where the moose roamed, moose was the hide of choice for medicine drums. (Kind of an old twist on the “buy locally” idea!) Today, the wild animal we have access to, is the moose. For three centuries, farmers have tried to domesticate moose and have failed every time. We take that as a good sign. We also make steer or bull hide powwow drums. Steer hides are almost always very thick and make great drums. The sound is very similar to moose but the hide has an elasticity, so drumsticks literally bounce off the drum head. The choice often comes down to wild or farmed hide and no matter what, a wild hide carries a certain energy with it. Our hide coverings last for years. Of course, the life of the covering depends upon the activity of the drum group. If there is any fault in the hide it usually shows up over the first few months but we guarantee our hide coverings for two years. When a drum needs to be recovered (because a busy groups will wear out a drum) we clean up the frame (revarnish) and pull a new hide for a reasonable rate. We have also been dyeing some of our hides with black walnut dye. When I was young I was taught how to pound black ash trees to harvest the wood for baskets. I was also taught how to make dye using the nuts of a black walnut tree. We have always guaranteed our hides, until the client paints the hide. Paint is a product that sits on the hide and stops the natural movement of the skin. The hide of a drum is constantly moving with humidity changes. Paint does not move - it cracks, and may crack the skin with it. A painted hide is not guaranteed to crack but it does increase the likelihood. But still some folks want a visual image on their drum. Several years ago while we were on the trail we found ourselves camping in a Native Woman’s walnut orchard in central California. While sleeping under the walnut trees we got to thinking about that old dye from my childhood. We made up a dye, threw a deer hide into the dye and discovered a forgotten tradition. 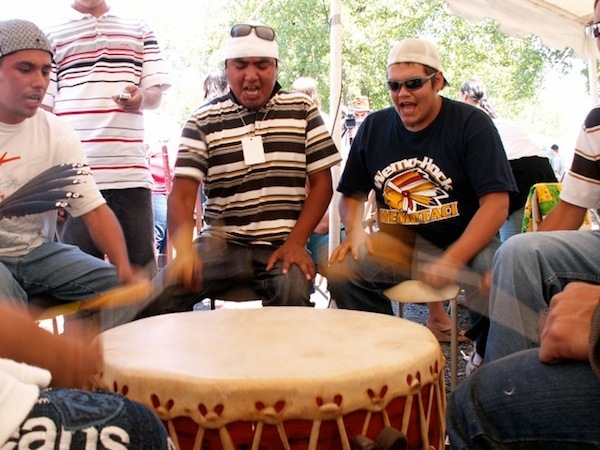 The tension of each powwow drum or hand drum determines its pitch and voice. It is impossible to build a drum which will sound the same every day in every different weather situation. A drum pulled for the east coast will behave differently at an eastern powwow than at one in the southwest, and vice versa. A drum which was pulled for a group in Albuquerque and has a nice deep, rich voice throughout the southwest will likely be flat if played at Wikwemikong on Manitoulin Island, Ontario in August. And then a drum pulled for high humidity powwows will sound very different when brought indoors to a stadium powwow where the building is heated and very dry. So we, as drum makers, do our best to take your ‘trail’ into consideration to build the best drum for your situation. Cost, Oh such a tricky subject ! Ready to pick a drum?